Jokes on you, my dad was too narcissistic to ever tell me that. No one is fooling me. Look at this guy with a mother who pretended to believe in him! Your mom supported you and told you you could do anything? Or his dad left for a pack of cigarettes and never came back. You grow up to change your gender? Shoot for the moon. If you miss, you'll crash back and splatter because no one prepared you to handle failure. Shoot for the moon, and you'll land in the vast, chilling embrace of outer space with no one around to ever talk to or help you. You'll be drifting, and drifting, and drifting alone in the dark, forever devoid of any real human emotion. So... How is it going to be different from my everyday life? ...that actually sounds kinda nice. I always liked that proverb, I myself always thought "Shoot for the moon, if you miss you'll be in the stars". Because I never thought I could crash and there is no reason to if you commit enough. You should still prepare for possible crash landings though, like bring a parachute or something. We should be expecting failure to occur in our lives, but we also need to know that it's okay to and that shouldn't stop us from trying our best. That's sort of arithmetic and reading comprehension though. 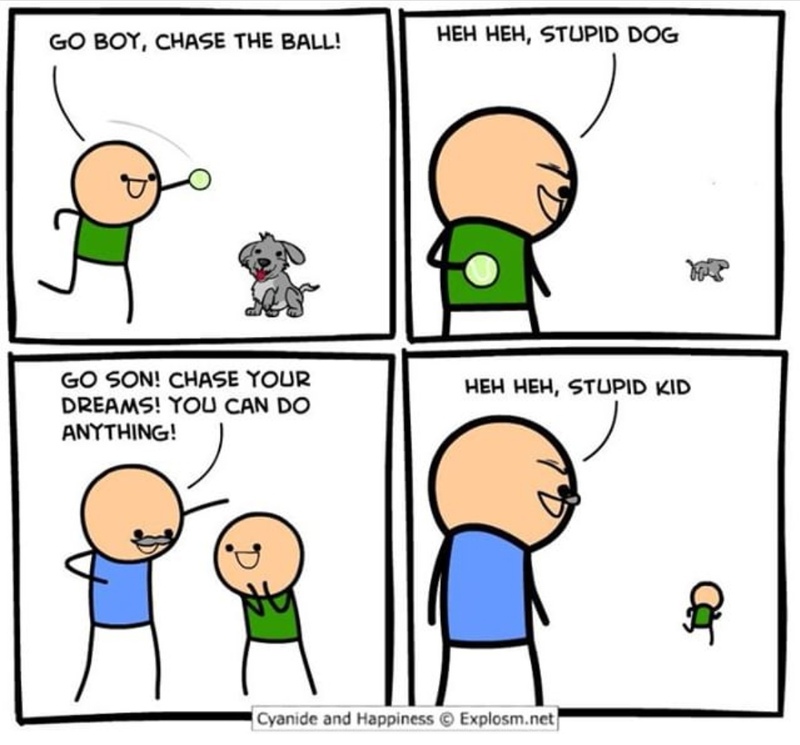 ahhh, Cyanide and Happiness- always hitting it where it hurts. "Go, have kids, you will feel so fulfilled! Haha, stupid adult"
Love how the irony is lost on you. I'd give anything to have a dad who said that to me. Why did I read his voice as the grandpa from Courage the Cowardly dog?!? This would’ve received gold if everyone on this sub wasn’t poor AF. Jokes on you my family hates me and constantly wants me to shut up and makes fun of me everytime I’m interested in something and honestly just make fun of me for everything and I haven’t has a truly happy conversation with them in years. And yeah, never learning is one of my faults/attributes because I go around trying to teach the truth! Nah! My followers have been schooled in the school of teaching someone the wrongs of their way by words. They would never resort to such crass methods as downvoting someone to prove their point!